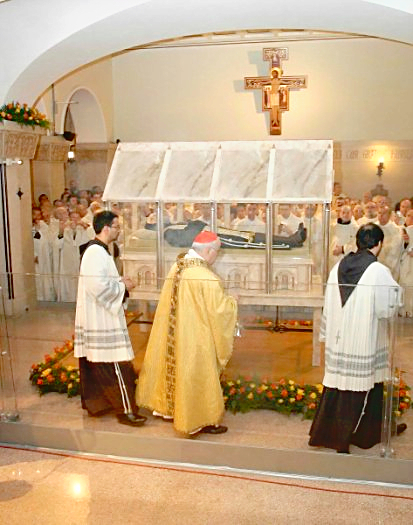 Throughout the years the Roman Catholic Church has found the bodies of some of their saints to be incorrupt. When this happens, the body is often put on display (quite often they are put inside a Church altar with a glass front). 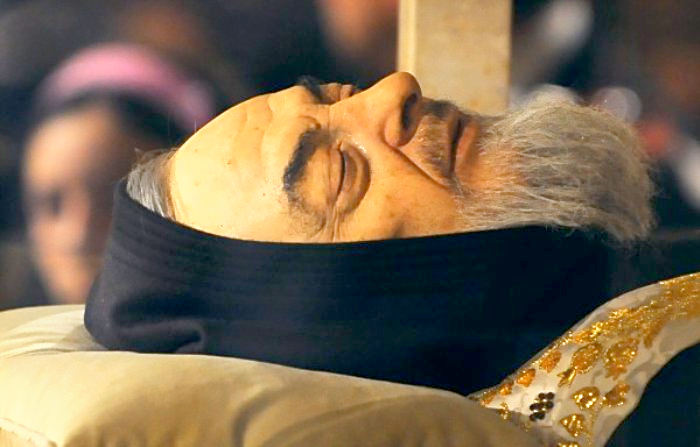 This is a list of the most famous incorrupt saints. You can read a much more indepth article with a photo and video gallery of incorrupt corpses here. More important, if less spectacular, are the spiritual healings that take place in all parts of the world! Padre Pio is a powerful intercessor! !Among his other gifts were perfume, bilocation, prophecy, conversion, reading of souls, and miraculous cures. People are still being cured through his intercession in ways that cannot be explained by medicine or science. For the canonization of Blessed Luigi Orione, the Catholic Church has deemed miraculoushealing of Peter Penacca healed in 1991 from a malignant tumor . In 1990 Peter Penacca, 78 years old, living in Momperone , in the province of Alessandria , was admitted to ‘ San Raffaele Hospital in Milan , where he was diagnosed with lung cancer . The doctors said that, because of advanced age, were not recommended nor surgery norchemotherapy . Family members, in early January of 1991 , they turned to ‘ intercession of Don Orione and the sick, in the space of a week , completely healed. After healing, Penacca lived for twelve years , working in the fields and as a carpenter . He died of old age in 2001 . The case, after the trial diocesan , which lasted from January 4 to March 12 1999 , was submitted to the Congregation for the Causes of Saints who, on July 7 2003 , promulgated a decree on the miracle , saying the inexplicable healing, rapid, complete and lasting. In 1872 Jean-Baptiste Lamy, the Bishop of the Santa Fe Archdiocese, commissioned the building of a convent chapel to be named Our Lady of Light Chapel, which would be in the care of the Sisters of Loretto. The chapel was designed by French architect Antoine Mouly in the Gothic Revival style, complete with spires, buttresses, and stained glass windows imported from France. Although it was built on a much smaller scale, the chapel bears an obvious resemblance to the Sainte-Chapelle in Paris. The architect died suddenly and it was only after much of the chapel was constructed that the builders realized it was lacking any type of stairway to the choir loft. 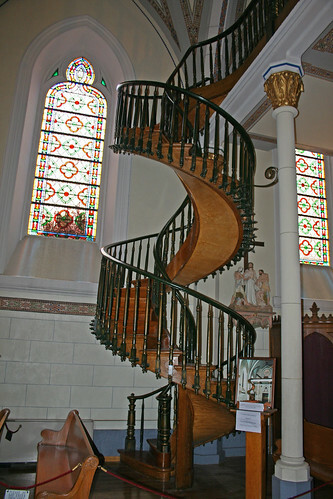 Due to the chapel’s small size, a standard staircase would have been too large. Historians have also noted that earlierchurches of the period had ladders rather than stairs to the choir loft, but the Sisters did not feel comfortable with that prospect because of the longhabits that they wore. Needing a way to get up to the choir loft the nuns prayed for St. Joseph‘s intercession for nine straight days. On the day after their novenaended a shabby looking stranger appeared at their door. He told the nuns he would build them a staircase but that he needed total privacy and locked himself in the chapel for three months. He used a small number of primitive tools including a square, a saw and some warm water and constructed a spiral staircase entirely of non-native wood. The identity of the carpenter is not known for as soon as the staircase was finally finished he was gone. Many witnesses, upon seeing the staircase, feel it was constructed by St. Joseph himself, as a miraculous occurrence. The legend claims that the mystery had never been satisfactorily solved as to who the carpenter was or where he got his lumber, and that there were no reports of anyone seeing lumber delivered or even seeing the man come and go while the construction was being done. Since he left before the Mother Superior could pay him, the Sisters of Loretto offered a reward for the identity of the man, but it was never claimed. Every time I hear someone claim to be an “ex-Catholic”, a sense of sadness comes over me. In just about every case, people leave the Catholic Faith due to a lack of understanding. After all, if Catholics truly believed that they were members of the one, true Church founded by Christ (and necessary for their salvation), nobody would ever leave! In an effort to help clarify what the Catholic Church teaches, I have compiled a list of 10 important facts that every Catholic should know. More than simply Catholic trivia, these are important concepts that can help us to better understand and defend our beliefs. In no particular order, these items have been compiled based upon my work at Following The Truth and my own study of the Catholic Faith. 1. Women Will Never Be Priests – Often incorrectly lumped in with the subject of married priests, this is a doctrine that has been infallibly decided and will not change. In 1994, Pope John Paul II issued an Apostolic Letter, Ordinatio Sacerdotalis, in which he declared once and for all that “the Church has no authority whatsoever to confer priestly ordination on women and that this judgment is to be definitively held by all the Church’s faithful.” Unlike the issue of married priests (which could possibly change), women’s ordination is an impossibility that will not happen. It is not a “glass ceiling” or the Church’s attempt to hold back women. Instead, it is an infallible recognition that men and women have different roles and that Christ instituted a male priesthood. 2. Fridays Are Still Days Of Penance – Ask almost anyone and they will tell you that Catholics are no longer required to abstain from meat on Fridays throughout the year. However, the current Code of Canon Law (CIC) states that, with the exception of solemnities, “All Fridays through the year and the time of Lent are penitential days and times throughout the entire Church.” (CIC 1250) Furthermore, “Abstinence from eating meat or another food according to the prescriptions of the conference of bishops is to be observed on Fridays throughout the year unless they are solemnities.” (CIC 1251) In the United States, the bishops have declared that it is permissible to substitute some other form of penance, but we are still urged to fast from “something” in remembrance of the Lord’s death on the cross. 3. The Bible Is A Catholic Book – Did you ever wonder how the Bible came into being? A little known, but easily documented fact is that the books of the Bible were compiled by the Catholic Church. For many years after Christ ascended into Heaven, there was debate about which scriptural writings were inspired by God. The canon of Scripture (the books of the Bible) was first formally decided at the Synod of Rome in 382. This decision was upheld at the Councils of Hippo (393) and Carthage (397). At these Catholic Church councils, the same 46 Old Testament and 27 New Testament books that appear in today’s Catholic Bibles were declared to be inspired by God. As a side note, approximately 1200 years after this decision was made, Martin Luther and the Protestant reformers removed 7 books from the Old Testament. As a result, most Protestant Bibles are still missing these 7 books. 4. The Mass Is The Same Sacrifice As Calvary – The biggest mistake that many Catholics make is treating the Holy Mass as “just another church service”, similar to those held by other religions. In the Mass, Christ’s Sacrifice on the Cross is made present, its memory is celebrated and its saving power is applied. The Council of Trent teaches that Christ left a visible sacrifice to His Church “in which that bloody sacrifice which was once offered on the Cross should be made present, its memory preserved to the end of the world, and its salvation-bringing power applied to the forgiveness of the sins which are daily committed by us.” When we attend Mass, we are mystically transported to Calvary, where we can unite ourselves with the Lord’s Sacrifice to the Father! 5. Annulments Are Not Catholic Divorces – Unlike the legal process known as “divorce” (in which a marriage is terminated), a declaration of nullity (annulment) states that a valid marriage never existed. This decision is based upon the finding that on the day that marriage vows were exchanged, some essential elements were lacking. This process is completely in conformity with the Catholic teaching regarding the indissolubility of marriage. Incidentally, the granting of an annulment does not render children illegitimate. 7. There Is No Salvation Outside Of The Catholic Church – Originally stated by St. Cyprian, the Latin axiom “Extra Ecclesiam nulla salus” reminds us that there is no salvation outside of the Catholic Church. This dogma was declared at the Fourth Lateran Council and is a source of confusion for Catholics and non-Catholics alike. According to the Catechism, all salvation comes from Christ the Head through the Church which is His Body. It does not mean that non-Catholics cannot achieve salvation. Individuals who are unaware that the Catholic Church is the one, true Church may still achieve salvation through the merits of the Church, despite their lack of knowledge. 8. In An Emergency, Anyone Can Baptize – Although the ordinary ministers of Baptism are bishops, priests and deacons, anyone can baptize in an emergency, even a non-baptized person. This extraordinary decision can be attributed to the necessity of Baptism for salvation and the Church’s desire to make it readily available to all. 9. Hell And Purgatory Still Exist – Contrary to the belief of many Catholics, the Church still teaches that “the souls of those who die in a state of mortal sin, descend into hell, where they suffer the punishments of hell, eternal fire” (CCC 1035) Furthermore, “all who die in God’s grace and friendship, but still imperfectly purified, are indeed assured of their eternal salvation, but after death they undergo purification, so to achieve the holiness necessary to enter the joy of heaven.” (CCC 1030) This purification process, formally declared by the Church at the Councils of Florence and Trent, is known as Purgatory. 10. Catholics Don’t Worship Mary And The Saints – Many Catholics are confused about the role of the Blessed Mother and the Saints. Should we pray to Mary and the Saints or should we go “right to the top” and pray to God? In a nutshell, the Catholic Faith teaches that we must worship God alone. Mary and the Saints are to be honored, not worshipped. However, their intercession can be extremely powerful and emulating their virtues can put us on the road to Heaven. While the above list only scratches the surface of the robust Catholic Faith, it provides a glimpse into the depth of Catholic teaching. Further explanation on these and other topics can be found by examining the Code of Canon Law and the Catechism of the Catholic Church, both of which can be found online at the Vatican website (www.vatican.va). Not only will studying the teachings of the Catholic Church enable us to better defend her when challenged, it will help us to become closer to Our Lord and Savior, Jesus Christ, who founded our Church 2,000 years ago. 1. In Catholicism, the title ‘Doctor of the Church‘ is given to a saint from whose writings the Church is held to have derived great advantage and to whom “eminent learning” and “great sanctity” have been attributed by a proclamation of a pope or of an ecumenical council. This honor is given rarely, only posthumously, and only after canonization. No ecumenical council has yet exercised the perogative of proclaiming a ‘Doctor of the Church’. Until 1970, no woman had been named a Doctor of the Church, but since then three additions to the list have been women: Saints Teresa of Avila, Catherine of Siena andTheresa of Lisieux. 2. Ashes used on Ash Wednesday are blessed palms from the previous year which have been burned. 3. There is a Archdiocese for the Military Services which has no physical boundaries or location. Headquartered in Washington DC, the Archdiocese serves Catholics in the military on land, in the air and at sea. The chaplains are not confined to the chapel. They go wherever their people are – in the desert, on the aircraft carrier, under the sea in a submarine, in the barracks on base, on a fire-fighting line, in the VA hospital, and in the halls of the Pentagon. The chaplains serve over 1.4 million Catholics. 4. The word ‘Catholic’ comes from the word “Katholicos” a Greek word meaninguniversal. St. Ignatius was appointed Bishop of Antioch by St. Peter, the Bishop of Rome. It is in his writings that we find the word Catholic used for the first time. 5. The very first printed Bible was produced under the auspices of the Catholic Church – printed by the Catholic inventor of the printing press, Johannes Gutenberg. The first Bible with modern day chapters and numbered verses was produced by the Catholic Church – the work of Stephen Langton, Cardinal Archbishop of Canterbury. 6. St. Katharine Drexel of Philadelphia, canonized a Saint in the Roman Catholic Church in October 2000, and her Sisters of the Blessed Sacrament, a religious community dedicated to the education of African Americans and Native Americans, established Xavier University in Louisiana, the only historically Black and Catholic University in the United States. Today, Xavier is one of only six schools chosen to participate in the National Science Foundation’s Model Institutions for Excellence in Science, Engineering and Mathmatics program. The College of Pharmacy, one of only two pharmacy schools in Louisiana, is among the nation’s top three producers of African American Doctor of Pharmacy degree recipients.